Interlibrary Loan is a FREE service that the Law Library arranges through agreements with other libraries to provide access to materials that we may not have in our own collection for academic use. ILL pulls materials first from the Law Library. If the material cannot be found here, then the search extends to the Lee Library and to other libraries after. It is rare for materials not to be available through this process. Set up an appointment with Melanie, the ILL Specialist, she will be able to help you navigate through the ILL process and help you obtain the materials you need. 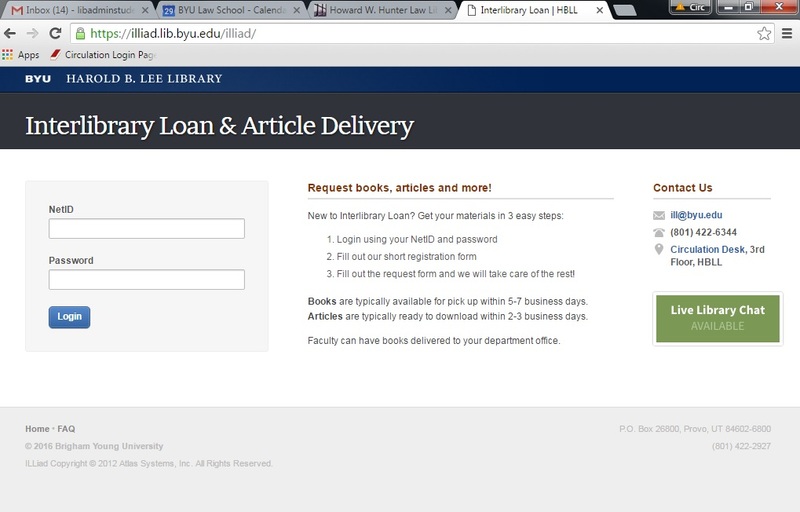 To set up your account, go to illiad.lib.byu.edu/ILLiad/ and sign in using your net ID and password, and then fill out your account information. You may also set up an appointment with Melanie and she will be able to assist you in creating your account. Feel free to set up an appointment with Melanie if you have any questions about ILL.